There are many great hiking trails around the Delaware Water Gap. One I have always wanted to walk is a leg of the Appalachian Trail and leads up to a precious place called Sunfish Pond. It's a somewhat strenuous hike, about 3 hours on the way up, but well worth the effort. The trip down is a lot easier, took us just over an hour. Daughter, Nell, and I loved the hike and rewarded ourselves with another adventure to some of the great pubs in and around Stroudsburg, PA., on the other side of the Delaware Water Gap bridge. Welcome to Mano a Vino, here you can discover great wines food and wine pairings, exotic cocktails, and reviews on fun restaurants in New York & New Jersey. Enjoy. The summer harvest is over but there are still lots of good things at the farmers market. Tonight we had a vegetarian dinner of fall harvest roasted root vegetables with steamed kale, brown rice and aduki beans complimented with a savory tahini sauce and a zesty ginger dressing. I found a perfect wine for the meal. You might be surprised I paired a red with a dinner like this but the red I chose, an Aglianico del Vulture (pronounced ah-LYAH-nee-koh del Vool-toor-eh) from Southern Italy, has beautiful soft apple and woodsy flavors that complemented the dinner perfectly. The wine was Terra Di Vulcano Aglianico del Vulture 2007. It is produced in the rich growing area that surrounds the ancient volcano Mount Vulture in Basilicata. The producer Azienda Agricola Bisceglia is certified by ICEA, the Ethical and Environmental Certification Institute, of Europe that supports fair and sustainable and organic growing practices. That seemed to fit well with the healthy meal we prepared. Michael Carrino Reinvents Passionné Restaurant Montclair - Fall Menu Tasting of "Progressive American Cuisine"
There are exciting things happening this fall at Restaurant Passionné. This makes me very happy since I've felt that the Montcliar dining scene has been getting a little tired lately. Now let me tell you, if you think of Passionné as a French restaurant you are only partially right. While Chef and Owner Michael Carrino's roots in French cuisine are deep and still very present they are only one part of what Restaurant Passionné is today. This October, in a beautifully redecorated space that is a wonderful sanctuary for comfortable dining and a gallery for local artists to display their work, Carrino is rolling out a new menu of "Progressive American Cuisine." It is an offering of delicious cuisine crafted with highest quality ﻿﻿local and global ingredients with international flair and value in mind. This past week, I had the tremendous pleasure of tasting some of the delightful new dishes that are on the fall menu and specials list at Passionné. We love value wines. 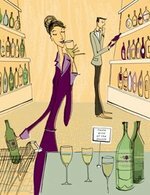 Wines that are well priced for what they offer. To our mind these wines run between 9 and 15 bucks a bottle. There are more and more great value wines available today, but finding good Pinots at this price level can be a challenge, especially when one has been spoiled by some of the finest Pinot Noir from Burgundy. But we never give up. Here are three we tasted recently, Pinot Noirs from Italy, France and New Zealand. All three were about $12. One disapointed, another was not bad, the third got a pretty good. But none a very good. Naomi our wine bartender served us up some very fine selections on a hot summer afternoon. Sorry Naomi, I promised this post over a month ago. Here it finally is. I love NY wine bars, heck I love wine bars everywhere. Inoteca on Rivington on the Lower East Side is one I have had my eye on for some time, years. But, it is always too crowded. It is the great films at the Landmark Sunshine Cinema that usually bring me to this neighborhood, but on this day we were all just strolling and Inoteca was quiet so we stopped in. The place seems so authentically Italian, very welcoming. Created by the exciting team of Jason Denton and his brother Joe back in 2003. Inoteca, its older sister Ino and sibling Corsina, not to mention the Denton restaurants, have set a high standard pursued by many.